Thinking of going on a Kenya beach tour? Here’s a guide to the highlights of the Kenya beach region. Kenya has 500 kilometers of white sand beaches, typically lined with palm trees and with fierce sun throughout the year. There are dozen such beaches. Which one to choose? Read my Kenya beach reviews here. The Kenya coast is perfect for diving. The reefs, a few miles off the coast, have created calm waters with beautiful coral reefs and plenty of exotic fish. During the diving season (October to March) visibility is excellent. Wind surfing has been popular in Kenya since the 1970s, and recently especially Diani Beach is making a name in kite surfing as well. Many other water sports are offered by the beach hotels and locals, too. Lamu Island is Kenya’s oldest living town. Like the rest of the region, it has been invaded many times by Turks, Arabs and Europeans. History still shows in Lamu’s beautiful Old Town, now a UNESCO World Heritage Site. Other highlights are the annual dhow races (January 1st) and the annual donkey races (October). Being 2500 years old, Mombasa is the oldest settlement in East Africa. Invaded time after time by Arabs and Europeans, it has developed a rich history that’s well preserved in Mombasa’s Old Town. Also pay a visit to Fort Jesus, the ocean-side military fort built by the Portuguese that’s now turned into a live museum with very good guides. The fascinating Gedi Ruins are the remains of a thriving Swahili town between the 13th and 17th centuries. Findings show that they traded with peoples across the world. The town was suddenly abandoned in the 17th century and it’s still a mystery why. The large (45 acre) plot is now turned into a national park, and shows houses, mosques, cemeteries and mansions. Dhows are the traditional sailing vessels of the Arabs, still used by Kenyans to fish and to get around the coast. It’s possible to hire dhows with crew for trips ranging from a few hours to several days. Sleeping is done on board and meals consist of fish caught the same day by the crew. The more luxurious dhows also have an outboard motor for when there’s no wind, but the more basic do not. If you’re looking to book a Kenya beach tour, I'm always advising to check out Africa Guide. 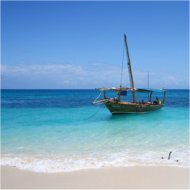 They are by far the leading company offering all kind of tour packages including beach tours to Kenya online, and they have an excellent reputation. Although their name suggest they target the whole of Africa, Kenya is their biggest focus together with South Africa. However, if you’d rather book a separate beach hotel or ohter seperate items of your itinerary, then Africa Point (don’t confuse the two!) in Nairobi has the stronger cards. No other travel agent offers more quality beach hotels in Kenya to choose from. Africa Point has a solid reputation for patient, personal help with picking the right stuff for your holiday. You can also check out my reviews of best Kenya beach hotels to help you make a choice.